How do I use my Booking.com discount code? 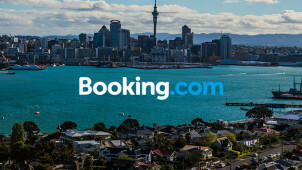 Check out Booking.com’s Facebook page for offers and news about what’s hot and where to go! Can I pay a deposit or pay on arrival at Booking.com? This depends entirely on the property, so be sure to check the terms and conditions before you book. Does Booking.com have a price match feature? Yes, it will refund you the difference if you find the same room and the same dates with the same cancellation policy on another website. How can I pay at Booking.com? Cancellation policy depends on the provider, date and room type so be sure to check this before booking. Most of its rooms have a free cancellation policy. Booking.com is one of the world’s foremost accommodation websites. When it comes to sorting your trip, why not book your hotel, rental or B&B on a site with over 1.5 million properties? Use a Booking.com discount code from vouchercloud and you’re sure to make a saving on your trip, leaving you with more money in your pocket to spend at your destination. This easy-to-use, peer-reviewed and highly trusted website won’t let you down. Booking.com has a number of handy features to ensure you always know what you’re getting. When selecting a room type, you’ll be able to view the room’s facilities including wi-fi, TV, free toiletries and more right next to the room's price. You’ll also be able to read reviews of people who’ve stayed there and see how quickly rooms are going. Finding out this stuff shouldn’t be hard and with Booking.com, you’ll know everything you need to in seconds! Booking.com is a great place to sort out your holiday rental with over 800,000 up for grabs. Ideal for settling into your destination and making a home away from home, rentals are perfect for couples, vacationing families or solo travellers who like to nest. Use a Booking.com voucher and you’re sure to make a saving on your property so whether you’re holidaying domestically, in Europe or further afield, Booking.com delivers the goods every time.